It's Pizza Week ladies and gents, that special time of year where we get to celebrate all things pizza. We're kicking off the festivities with legendary pizza artist Domenico Crolla and honoring one of pizza's greatest heroes, Pizza Rat, the bold NYC rat who put everything on the line for a taste of NYC pizza. Crolla has pizza-fied some of the most iconic faces, ranging from Rihanna to Trump to Marilyn Monroe, and we thought Pizza Rat -- the rodent, the myth, the legend -- deserved the ultimate tribute of being sauced onto what he loved most. 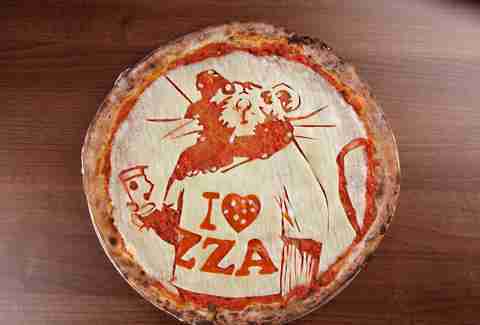 Wherever you are Pizza Rat, this one's for you.